Iran does not send weapons or military personnel to any country, Chief of the General Staff of the Armed Forces of Iran, General Seyyed Hassan Firouzabadi said commenting on information about Iranian weapons and troops sent to Syria, circulating in the Western media. 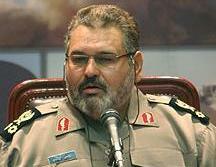 “Iran does not send weapons or military personnel to anyone. Our support has been political, scientific and formal in character,” Firuzabadi told journalists during a parade held in Tehran in connection with the Day of the Armed Forces. He also said Iran is able to provide security not only in Iran, but also in the whole region.